Yesterday, Nick Anderson was named our Twins Minor League Relief Pitcher of the Month. Today, we’ll find out which starters had solid performances in April. There have been some months where it’s been difficult to decide the winner. There have been months with strong performances but an easy choice at the top. This month, there were several solid performers, but the choice wasn’t easy. Before we get to our Top 4 starting pitchers for the month of April, here is a list of a couple others who deserve to be recognized for a solid final month of the season. Fernando Romero - Rochester Red Wings - 4 G, 3 GS, 21.0 IP, 0-1, 2.57 ERA, 1.29 WHIP, 17 H, 10 BB, 20 K.
Anthony Marzi got the Opening Night start for the Miracle, and he’s been good since. He did pitch once out of the bullpen, but that was just piggybacking a Phil Hughes rehab start. Marzi was a graduate of the University of Connecticut in 2014. He went undrafted, but that winter he signed with the New York Yankees. In 2015, he pitched in six games for the GCL Yankees before being released in March of 2016. He tried out for the independent New Britain Bees of the independent Atlantic League and did well in 2016 and 2017. In late June 2017, he was signed by the Twins because they needed starters in Cedar Rapids. He made nine starts for the Kernels and pitched well enough that his final regular season start came for the Ft. Myers Miracle. While the left-hander does not throw hard or miss a lot of bats, he can be effective by hitting his spots. He has been able to do that since signing. Wells had a terrific month. He’d done a terrific job of limiting base runners. He doesn’t give up a lot of hits, and he doesn’t hurt himself with walks. Wells was the Twins 15th-round pick in 2016 draft out of Division II Cal State - San Bernadino. He ended that season strong in Elizabethton, and last year he went 5-3 with a 3.11 ERA in Cedar Rapids, though he was limited to 75 innings due to a couple of injuries. Wells went to work this offseason and lost 25 pounds and came to spring training in great shape. Gonsalves is not a new name to these monthly starting pitcher awards. He’s won several of the monthly awards, and he was the Twins Daily Minor League Starting Pitcher of the Year in both 2016 and 2017. After his 2017 season, the Twins added him to the 40-man roster. He went to his second straight big league spring training. It was a bit of a surprise that he was sent to AA Chattanooga to start the season. It was much less surprising to see him put up really impressive numbers through his first four starts. It’s also not surprising that his first start of May was with the Rochester Red Wings (or that he threw 7 2/3 scoreless innings). The former fourth-round pick from San Diego is on track to make his major league debut sometime in 2018. 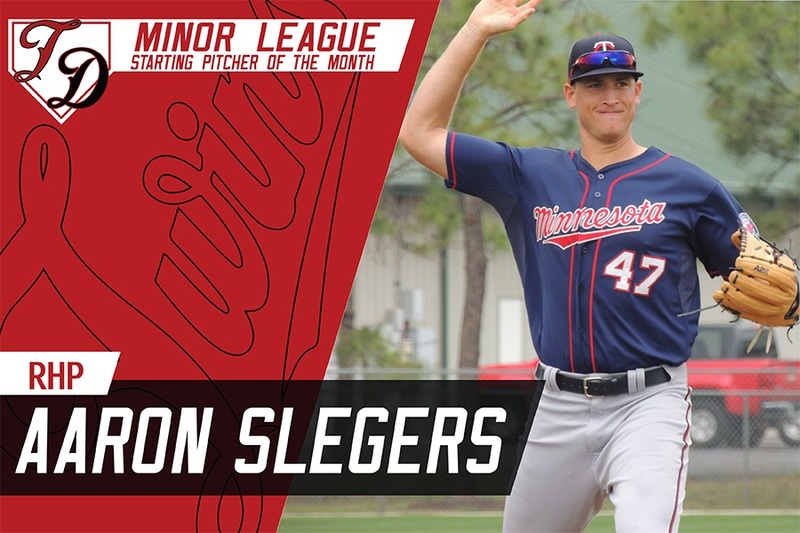 Speaking of guys who have been mentioned in these reports a lot, Aaron Slegers was twice a Twins Minor League Starting Pitcher of the Month in 2017. He even made three big league starts. He was the runner-up for Starting Pitcher of the Year. And he has started out 2018 very well as well. Slegers threw six innings in all four of his starts. He had four quality starts and twice he didn’t give up a run. He even got to spend one day in the Twins bullpen in New York, called up in case a long reliever was needed. Slegers was the Twins fifth-round draft pick in 2013 out of Indiana University where he had been been the Big 10’s Pitcher of the Year. He has moved up one level each year and has developed well at that pace. After debuting in 2017, Slegers returns to Rochester where he will continue to pitch in hopes of more of those call-ups. Congratulations to our Twins Daily Minor League Starting Pitcher of the Month of April, Rochester starter Aaron Slegers. The future needs to be now. Gonsalves and Slegers need to be breaking in with Romero. (and Gordon needs to be up while Sano is out playing every day but that is another thread). Young and hungry is exactly the infusion this club needs. Hughes is done. No more pontifications, ruminations, perseverations, machinations or-most-importantly- rationalizations. Lynn can go to long relief and EARN his way back into the rotation. He is on a 1 year contract....short leash. A reminder, many of the Twins' top prospects are featured in TD's Adopt-A-Prospect project. You can find my page for Aaron Slegers here. Consider adopting a player of your own! Slegers is a nice depth guy to have in AAA. He still strikes me as a AAAA pitcher. Doesn't miss a lot of bats. Maybe as a long relief guy, when Hughes more than likely fails. Glad he's pitching well, but with Santana, Gonsalvez and Trevor May all probably available sooner than later, I think Slegers is good where he is right now. Unfortunately for Slegers, as a starter he is gonna be buried in depth barring injuries unless he ends up helping out in the bullpen. Many starters have gotten a good intro to the majors in the bullpen (Johan Santana being the elite Twin to have done it) so it might not be a bad thing especially given the status of that bullpen this year. Great article. I wonder what Slegers' ceiling might be. I hope I'm wrong- but a tall Anthony Swarzak? Both throw mostly 4-seamers and sinkers. Velocity is similar at the same stage of development. Interestingly, Swarzak has moved up to ~ around 95 MPH from ~90 since he left the Twins- along with a significantly increased K-rate. Perhaps Slegers can see similar upticks out of a major league bullpen? Interesting to hear the talk/speculation centered on Gonsalves moving up to the big club and bumping Lynn into the long spot that opens with the departure of Hughes. Slegers has been better than Gonsalves...is all of 25 years old and was drafted one round lower than Gonsalves.To be fair, Gonsalves has been border-line spectacular pretty much his entire minor league career, and has a better K rate than Slegers.But Slegers also walks fewer batters, and has been a very good minor-league pitcher for a while now, as well. It's amazing to think that this team is about to reach a phase where one can make an argument that Aaron Slegers is a couple weeks away from being the number 9 starter on the organizational depth chart. (Assumes along with Santana, Gonsalves and Trevor May are/will be ahead of him. )No stud number 1...but there hasn't been this type of legitimate depth for quite some time. Of course, meanwhile we can't score.